What a game all about controlling the most power and becoming the ruler of all Laar? 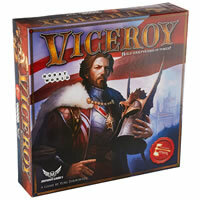 Viceroy is a strategic board game where players will brawl for control over Laar, a fantasy world. They’ll attempt to recruit allies and enact various laws. Each player builds their own pyramid of power with the help of magical might and their state’s military. They’ll gain gemstones and increase their authority in the fight for dominion. Viceroy will take some time to play and isn’t the easiest to learn how the rules work. It’s great for smaller groups of 1-4 players and will require it’s players to be at least 12 year old. With a myriad of colorful and uniquely styled game pieces, Viceroy will catch your eye and entice you to play. See if Viceroy is a good fit for you and add it to your collection today. The player who has the most power points after the final scoring is the winner of the game. Inside the box are 64 character cards, 24 law cards, 4 auction cards, 64 gemstones, 33 double-sided magic/science tokens, 17 double-sided attack/defense tokens, 54 power point tokens of different values, 24 bonus tokens for magic, 12 bonus tokens for circles, 4 players’ screens, 1 scoring pad and the official Viceroy game rules and instructions. Please keep in mind that the official Viceroy board game rules and instructions could be different depending on the game version you have. The rules below are some of the exact directions on how to play Viceroy. Share with us your comments, funny stories, tips, advice, strategies, creative ways to play, questions about how to play, problems with the rules or anything you want about Viceroy. All submissions will be reviewed within 24 hours. Click here to add your Viceroy comments.